About a week ago, I gave a presentation to some women at my church. There was a big back to school activity and we wanted different people to present on different topics and I spoke about organizing. Organizing your house, organizing your life, mostly about organizing your junk drawer. I thought after the event, why didn’t I record that? HERE IS THE PRINTABLE PDF I mention in the show. You can print it off, and follow the steps, and organize that junk drawer with my tips! This cool Airbnb is in East Austin. Just a little bit east of Mueller. It’s nearby downtown without being in the middle of all the craziness. It’s an airstream that’s tucked in behind a family home, so it’s back in the yard and the woman who owns this property is this amazing. I read the guestbook and I was just blown away by the story. The owner felt called to buy the front home. Soon after she began taking foster kids in and sharing her love with them. 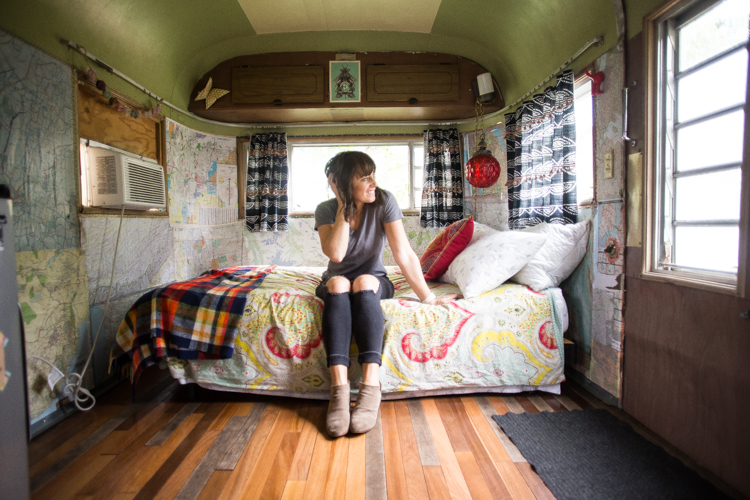 Realizing she could help more kids with more space, she bought the Airstream to rent as an Airbnb that would fund some renovations on the main house. Fast forward a few years and she has adopted 5 foster kids! She says her “foster tubes are tied” which was such a cute way to talk about her family feeling complete. and I love this house built with love. The yard feels like Austin in the most intense way. It has these crushed gravel pathways, colored string lights. There are chickens, goats, a pig, and a really cool dog all on property. A couple of cats that wander around. It’s quiet and cool and just feels homey. And you could hang out and chat with her and her kids if you want or you could have your own stay, but just a really great place to stay that has this great hip vibe and a really, really cool story behind it. Contigo is a modern, upscale American food modeled after a Texas ranch. They have a really great menu, but my very favorite thing on it is the Farmhouse Burger. It’s so delicious. The patty is amazing. I put cheese and bacon on it. Of course, there’s pickles and let us and tomato and it’s this brioche bun that’s just the most soft and fluffy. The fries are amazing and if I’m going into the restaurant I will also as an appetizer order the fried green beans with their spicy aioli. Seriously, life changing. Laguna Gloria is an outdoor sculpture garden right at the base of Mount Bonell. It is part of the Jones Center for Contemporary Art. It’s just a beautiful place to spend some time outdoors. There are permanent works scattered throughout the property, which sits right on the water of Lake Austin. You can see the works of art and you can also just enjoy being in nature, enjoying the beautiful weather, going out and having a picnic on the lake. The steps that I want to propose to you for this really simple junk drawer organization are the exact same steps that I use to organize all different areas of my home and different areas of my life. I think that they’re universal principles that can really be infused into any type of organization. Raise your hand if you have a junk drawer. I’m guessing all the hands are raised. I don’t know when this became a thing, but it is a thing and it is sort of a reflection of the state of our life in some ways. We get in a hurry or we have more than we need and we want to put it away, but we don’t really want to deal with it all the way. We just want to get it out of sight, out of mind, and so it all goes into the junk drawer. I think by giving some time and attention to that junk drawer. It’s a good, easy, quick place to start with some of the overall disorganization that may exist in our homes at large and maybe in other areas of our life as well. It’s such a simple concept and I don’t know that we all think about our belongings that way. I think that that is a good question to reflect upon as we get started through this organization, we likely all have more than we need. Do you have things in your home that you don’t remember or their closets or drawers or cabinets in your home that you couldn’t tell me exactly what is in there? Are there things in your home that you don’t really like? The kind of annoy you and you see them and you think, Gosh, why is that here? Are there areas of your home that caused you anxiety? You don’t want to open that door. You feel Yucky when you walk through the garage because it’s just filled with all this junk. 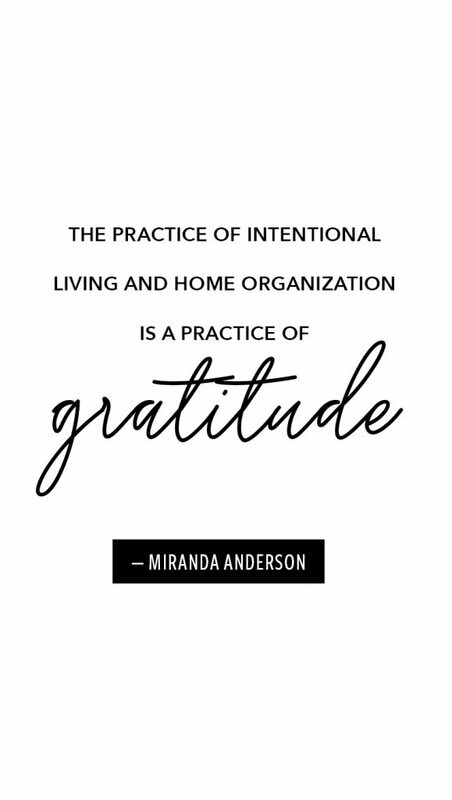 “The practice of intentional living and home organization is a practice of gratitude.” When we know what we own and we love it and we use it, we’re able to feel more grateful and present in our everyday lives. We often brush aside the things that we own as not mattering that much because it’s just stuff. In one way, yes, that’s true. It doesn’t matter in the overall scheme of things because it’s just stuff. But in the way that it impacts our everyday life, whether our belongings and the way that our home is organized makes us feel good and more able to accomplish the goals and feel fulfilled right now, or if it does the opposite, if it gives us those negative feelings, that anxiety, that stress…it really does matter. 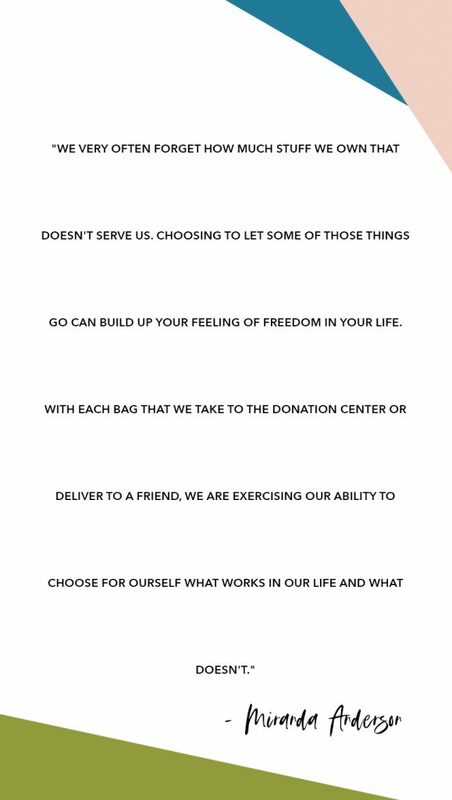 Like Marie Kondo says, “The question of what you want to own is actually the question of how you want to live your life.” It starts to make a big difference. Another quote that I love was from a conference I was listening to in 2014. I have shared it multiple times in my blog and throughout my own intentional living journey. It really brings it back consistently to this matter of me being in control and in charge and responsible for the things that I own. One place to begin having enough is to reduce the useless items that we bring into our home. I talk a lot about that idea of reducing our consumption or in our case– in 2017–stopping our consumption completely through a year of not shopping. You can listen to that story in Episode 04. That’s one way to start this process. The other way is to organize and declutter the things that are already present in our homes. The things we already have. Both of those steps together is where you’re going to get the most benefit in this organization process. This episode is an episode where I want you to do some homework. I don’t want you to listen. Then think, okay, that was fun and move on. I actually want you to do this. If you need the printout, it’s HERE FOR YOU. It’s a free one page pdf that has all of these steps and some of the tips along with them on one page so that you can just follow right along. I want you to choose one small space where you can implement the guidelines that I’m about to share. I say the junk drawer because everyone has one. It’s usually a really small space and you can approach it and go through it probably in 20 minutes. Definitely not more than hour, so it could be a really quick way to get started. Once you start going through things, thinking about them with intention and getting rid of the things that you don’t love, it becomes kind of addicting. That feeling of freedom and the lightness that you feel as you remove unnecessary things from your life is really amazing. So if you don’t want to go for your junk drawer or maybe your junk drawer is really organized, you already did that one. You could find somewhere else. You could choose the area beneath your bathroom sink. That’s an often overlooked place because no one else sees it, but guess what? How does it make you feel when you open the cabinet beneath your bathroom sink? Do you feel happy? Do you feel free? Do you feel grateful? Or do you feel kind of annoyed? Like, What is all this stuff? Why is it here? Why is it a mess? You could think about organizing the top of your desk. Maybe that would be a space that would be helpful because it will really improve your everyday life as you’re trying to get some work done. Maybe you want to focus on the linen closet if you’re anything like me. So I want you to choose a space. Think about it right now. What space are you going to use if you’re running or driving or washing dishes, and you can’t do this right now. I don’t expect you to do it right now, but I’d love you to do it in the next couple of days. I want you to at least choose. Think about Episode 05 where I talk about making a choice. It doesn’t matter, there’s no wrong answer. Just choose one space and that’s what you’re going to focus on. Okay? Do you have it in your head? Okay, let’s get started. Remove every single thing from the space. A lot of times we think that we can organize by just sort of rearranging things within the space that’s not going to fly here. I want you to actually look at every single thing that exists in that space, so take it all out. If it’s your junk drawer, it’s probably not going to take up the whole room for you to take everything out of there, but it is important for you to actually hold, look at and acknowledge every single thing that exists in that space. Once you take it all out, I want you to sort it into similar piles. What this does is help you understand what you might be unknowingly collecting. This sorting also gives you an idea of what type of organization might work best. If I’m naturally putting a certain type of thing in an area where it doesn’t belong, that might be a good indication of how I’m functionally using my space in a way that’s different than what I intended. So sort things by similar piles and consider how you’re using the space and what you might be unknowingly collecting. Clean out that space. You don’t want to start putting things back in to a drawer or cabinet or closet that is dusty and dirty and has weird hairs and pencil shavings of the bottom. Grab a clorox wipe or vacuum the dust and clean it really well. This is another reason why you want to take everything out because it gives you a chance to really clean the space. Would I buy this again today at full price? Sale is not a good reason to buy something, and it’s not a good reason to hang onto it and keep it forever. If you answered “no” to one of the questions, the chances are that the item is not adding much value to your everyday life. That right there is the question that fills people’s homes to overflowing with plans for the future instead of allowing them to live well in the present. If you really do need one of those someday, you could probably get it on Amazon with two day shipping and that is worth it to get rid of it now because that eventual hypothetical someday probably won’t happen. 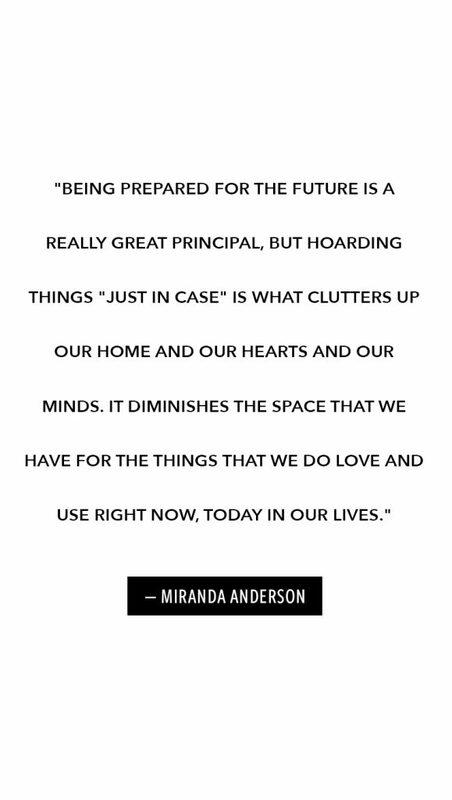 “Being prepared for the future is a really great principal, but hoarding things “just in case” is what clutters up our home and our hearts and our minds. It diminishes the space that we have for the things that we do love and use right now, today in our lives.” If you are holding onto something because you think there’s a possibility you might need it some day, I’m going to suggest gently that you might not. This is another big reason people hang onto things because of an attachment to the past. We used to love it and so we feel like we owe it to our past selves to hang onto it forever. Keeping things because of an attachment to the past is also taking away from the time, energy and investment that we can make in our present lives. Choose one small box to keep for posterity sake and go through it regularly and decide a couple years down the road. Something that feels really, really sentimental today might not be so sentimental, so a key with storing those heirloom pieces is that you are looking at them more than one time that you’re making that decision at different points along the way because at some point it might not feel a sentimental anymore and at that point you can get rid of it. Another thing I love to do for things that are a little bit sentimental is to find new homes for them, for people who will love them like I once did. An example of this is with a lot of my kids’ clothes, like baby and toddler clothes that I really, really loved, but I don’t need to keep them. Especially once I was not having any more children. I love to give those clothes away to people, friends, family members or charities where they will be used. 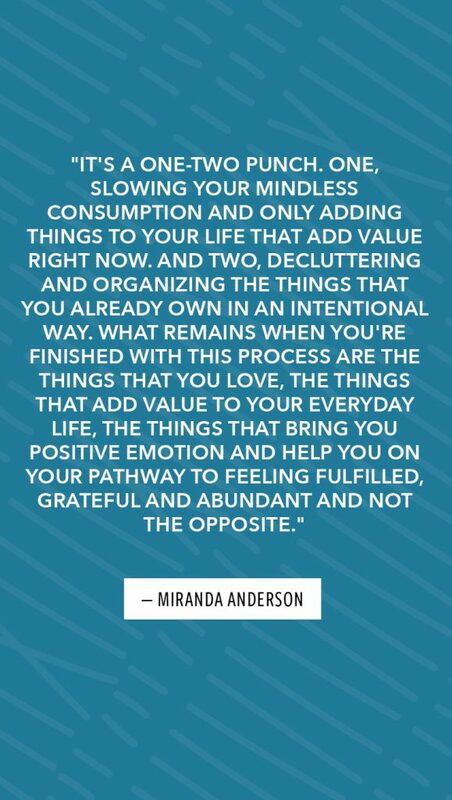 Once you’ve decided these things are not adding value to your life, you don’t need to keep them. You need to get rid of them, and there are so many different ways. Some things may just go in the garbage. Some things can go to a local charity. Some things you can give away to friends or family members, higher ticket items. If you have the energy and you want to sell them, you can put them on facebook marketplace or craigslist, sell them through instagram. Some people say to put things in a bin in the garage and look at it again in six months. I have found that as soon as I decide no to something, it’s very, very unlikely that I will have remorse about that, so I like to donate those things right away and feel the immediate freedom that comes when I get rid of them. At this point, paradoxically you may want to buy a bin or something to put in the space so that your junk drawer or beneath a sink is organized. Do not sort and put back until you have gone through the process of getting rid of the things that you’re saying no to. After you get rid of that, and now what is in front of you are the things that you love, that you use that add value to your life. Those are the things that you want to organize and if possible. Leave some breathing room between your bins and your basket. This space will bring a sense of peace and calm into this small area of your life. It will remind you of the value of empty space, the way that that feels, to just have a little bit of room. There is a place to breathe, to let your eye settle. If you’re a designer, you’ll know that the empty space, that negative space is just as important and sometimes more important than the anchor pieces. Having a little bit of room for things to breathe and to look beautiful and to feel intentional will help you resist the urge to fill it all up again. How does that feel? Organizing even your junk drawer…this tiny little area, will feel empowering and might be a little bit eye opening for you. When you sort through and make decisions for yourself about what you love and what you need, you feel the freedom of choosing your own path and your own life and that is so empowering. Recognize how these steps can and should apply to other areas of your home and other areas of your life. Sort things into similar piles to get a gauge of what you’re collecting. Clean out that space. Wipe it down. Get rid of the dust bunnies. Decide what to keep by asking yourself the question: Do I love this? Do I use this? Would I buy this or choose this again, today. Get rid of the no’s. Gt rid of the things that you do not want. Put back the items you’re keeping grouped by type so that they feel organized. Leave a little bit of space. Leave some space for possibility. Leave some space to breathe and for that peace and calm feeling that you want in your life. Thank you so much for being here. 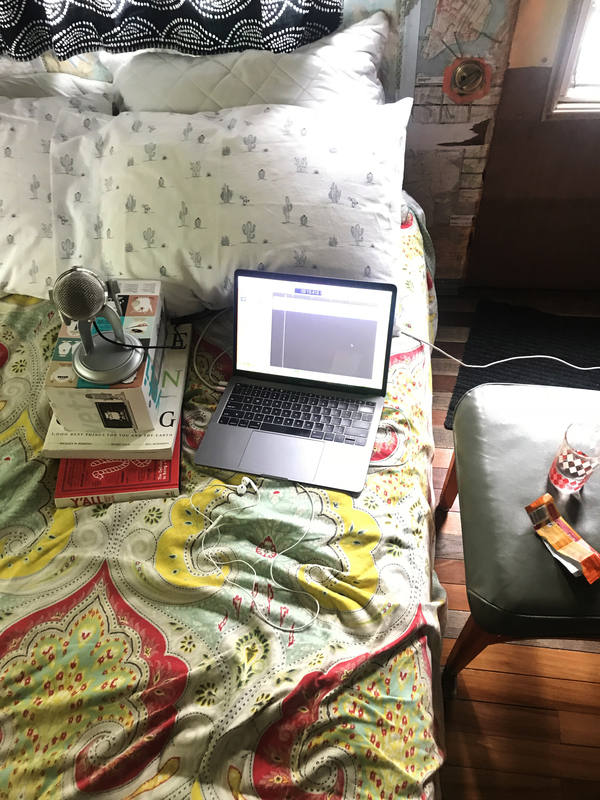 I am really, really loving doing this podcast. I hope that you’re loving it to please take the time if you haven’t already, to rate and review the show in itunes. 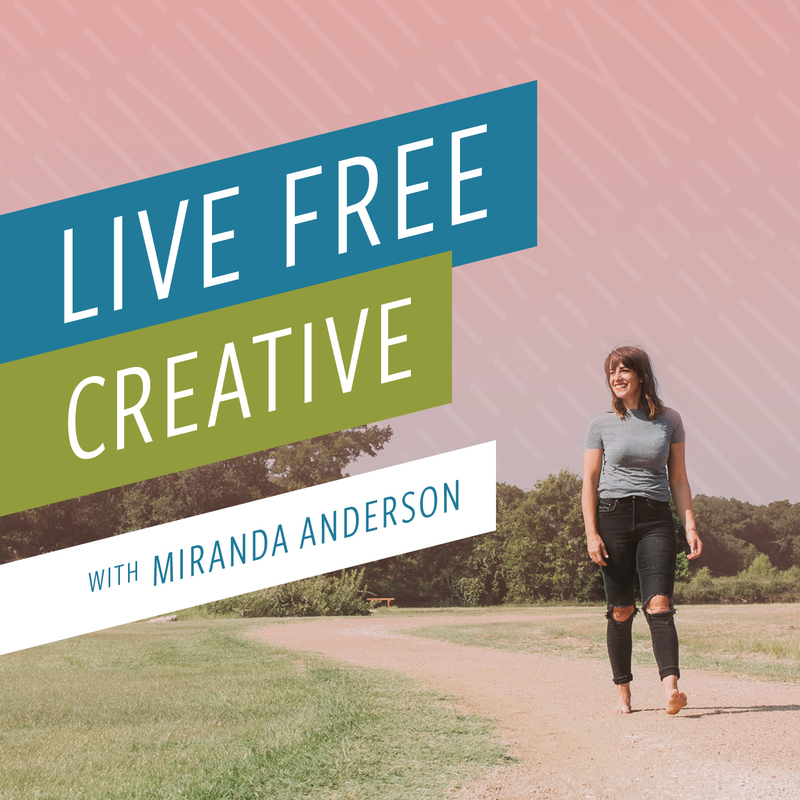 It makes such a difference for the show to be able to reach a larger audience and I can share these same ideas and principles for a creative, adventurous, and intentional lifestyle with as many people as can.